The enormous changes of modern media society in tandem with constant technological advances in the field resulted in a significant change of forms and functions of modern children‘s and teen books. The fact that the technological progress can enrich print products has recently been shown by the providers of the electronic reading pens. 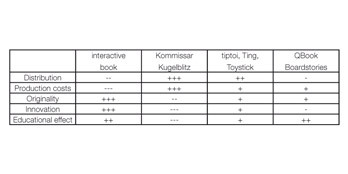 While Ravensburger celebrates successes with the digital audio learning system tiptoi®, the distribution company Chefeu launched the Toystick and as of February 2011 the printing house Himmer is offering the ting sensor pen. With the help of the electronic sensor pen, printed contents can be heard and experienced interactively. In principle all manufacturers use the same technique, printing small codes invisibly behind pictures, texts or other printable media. If the user touches a picture or text element with the reading pen, a sensor in the tip of the pen reads the appropriate code. Through headphones or built-in speakers, the device will play corresponding sound files, the user has previously downloaded from the Internet and stored on the pen. This can be for example, noises or explanations of an image. Digital Media is developing fast and therefore competitors from different branches will enter the market of children’s entertainment. From the area of conventional book publishers digital add ons to books and book plus offers are to be expected. The competitors mentioned above may be expanding the fields of application of their products such as tiptoi or Ting. 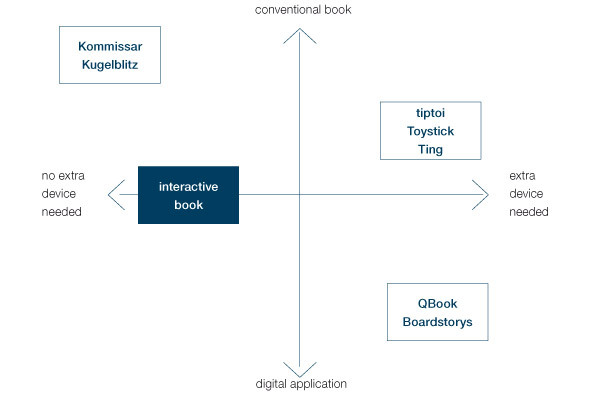 As there is a shift to the digital market also developer of computer games and role plays may become competitors for interactive books although mainly in the digital area. And of course conventional game publisher amplify their products with more technical applications than they already do. As the market of applications for smartphones and mobile computers is growing really fast there will be many new companies entering the market and connect books or ebooks with interactivities like QBook already does. Due to the fact that all the files needed for a printed book are already formatted for different applications new ideas in terms of digital will have an easier access to the required data which reduces developing costs. 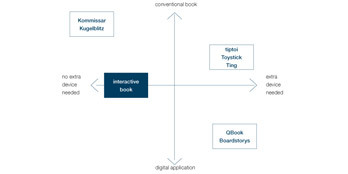 The target group for the ‘interactive book’ is represented by readers between the age of 8 and 10, who are enthusiastic about technology and are eager for knowledge. At this age especially technical aspects are requested. The children have enough reading skills and possess the already developed perception of the situations, which they face in their daily life. Supported by their parents they can also understand complex contexts and topics. As already established in the target group analysis they belong to the sinus milieus of the middle. Therefore the parents have keen interest in promoting their children. They are open to the media progress but balance out the advantages of it. Hence they broaden the main target group even though the children usually chose books according to their interests themselves. The classic format for children’s books is the portrait format. It is applied both to the non-fiction books and to the children’s novels. 20 x 20 cm format was chosen to differentiate themselves from the competitors and also because of its appropriate size for the bookshelves. It provides enough space for text and pictures and is also convenient to hold by small children’s hands. Unlike the competitor’s products, as listed in the competitor’s analysis, the book is equipped with the electronic components, which are directly built into the book and help to use it. The chosen format provides enough space for that as well. With these components the reader is involved into the story and actively takes part in it. 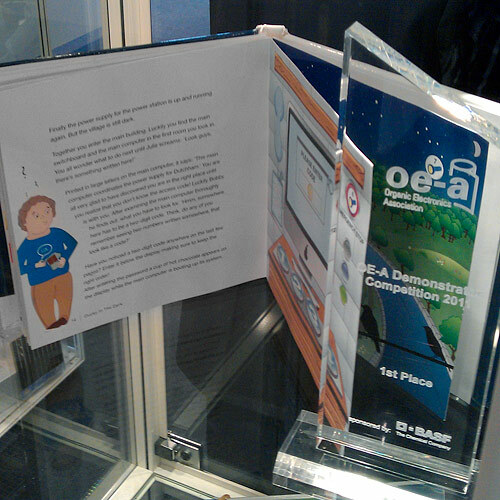 The components are combined into games, which are the parts of the plot and are activated by an attached magnet, attached to the book with a ribbon. Due to the progressive development in the field of printed electronics the components are very thin. Still it is necessary to use firm paper to guarantee their sufficient functional stability. Due to the necessity to place the printed electronic elements between the actual book pages a new binding method had to be developed. The chosen paper is able to balance out the waviness that the printed electronics cause once the single pages are finished. That is the reason why a matte coated image printing paper with 170g/m2 was chosen. Furthermore, the matte coat improves the text’s readability in the contrary to the glossy coated paper. To give to the relatively thick book block some stability in the bind the hardcover is used. On the rear cover a solar cell for the power supply of a small display is attached. The power supply of the components in the book is provided by the printed batteries and the rechargeable batteries, which are partly charged through RFID. On the cover a picture of one of the main characters of the book and the title ‘Ducky in the dark’ are located. To increase the attention of the buyer a OLED is used. The 20-pages book’s basic layout is simple. On the 7 spreads are the interactive components on the right page each time whereas the text is on the right page. The pictures were drawn by hand and finished with Photoshop. Thus, the created comical style is very popular with children. By integrating the reader in the story, e.g. through the empty profile at the beginning of the book, he is incited to take part in the development of the plot. To enable a good readability for the young readers the body text is set in the font in Helvetica Neue with the type size 12 pt. This sans serif font is similar to the classic fibula font and the extended line spacing eases the tracking of each line especially for the beginners or unpracticed readers. For the headlines and stray accentuations the font Homer Script and type size 15 pt were used. The amount of the text per spread was chosen so that the young readers aren’t over challenged and thereby don’t lose the fun of reading. Therefore the language was kept simple. On the inside of the book’s board the magnet is stored through steel foil in a laser cut immersion.